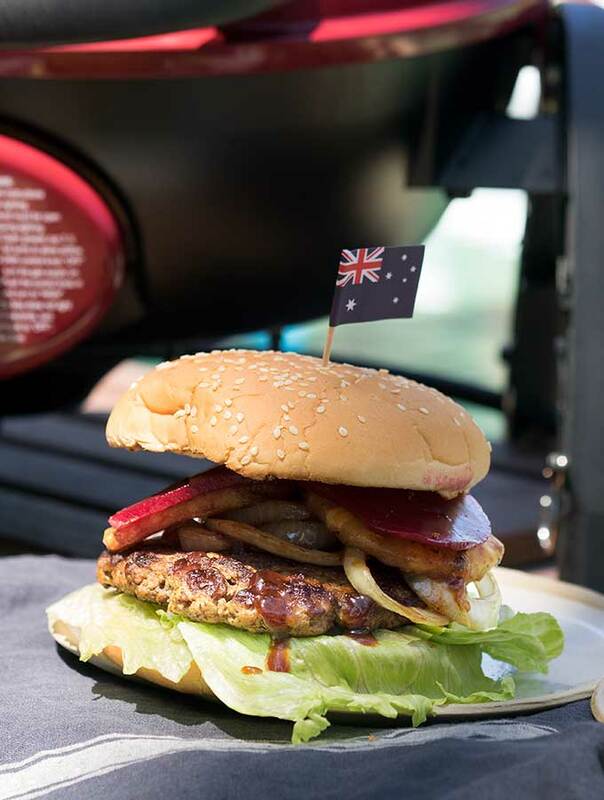 The Aussie Burger is a national icon, close to many Australians’ hearts and stomachs. Beetroot is a must, but the question is, a true Aussie burger with the lot or not? Either way you will love them. Every year Aussies celebrate Australia Day, 26th January. What better way to celebrate than with a good old fashioned Australian barbeque. Steaks and snags (sausages) are always delicious. You could even throw a prawn (Aussies don’t say shrimp) on the barbie. I think that Aussie burgers are the way to go. Your stomach and tastebuds are going to agree with me. Why not try our beer can burger recipe on the barbeque too! “A burger with the lot mate” a common cry at the local milk bar when growing up. Sadly, these days, the Aussie milk bar is as easy to find as a Tasmania Tiger. May not completely extinct, but they are few and far between. Most Australian burger joints these days sway to the fancier side of the bun with American influence. Instead head to the local greasy spoon (take away) and you will find a traditional Australian burger. You’ll even be able to order a burger with the lot. A burger with the lot is large, groaning under the ingredients and impossible to get your laughing gear (mouth) around. 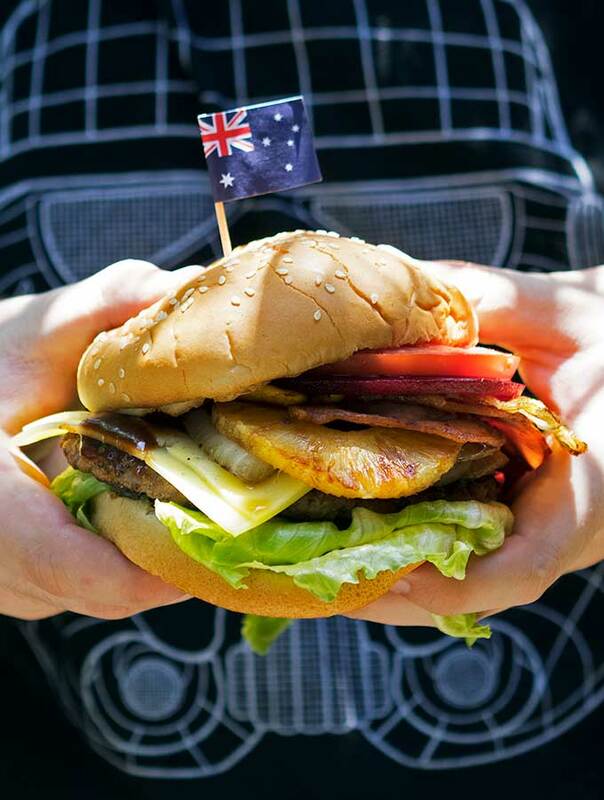 There are a few items you will find on an Aussie burger that are a must and unique. Not everyone understands or likes the way we Aussies make burgers. David Chang upset a lot of Australian burger lovers a few years ago (he still gets hate mail). “You know who f#@%s up burgers more than anyone else in the world? Australians. Australia has no idea what a burger is. They put a fried egg on their burger. They put canned beetroot on it, like a wedge of it. I am not joking you. This is how they eat their burger.” David Chang, Burger Manifesto on Lucky Peach (Lucky Peach magazine and website no longer exists, unlike the Aussie Burger). Well David, let’s agree to disagree. By the way, we don’t put wedges of beetroot on our burgers, it’s slices mate, and they are damn delicious. 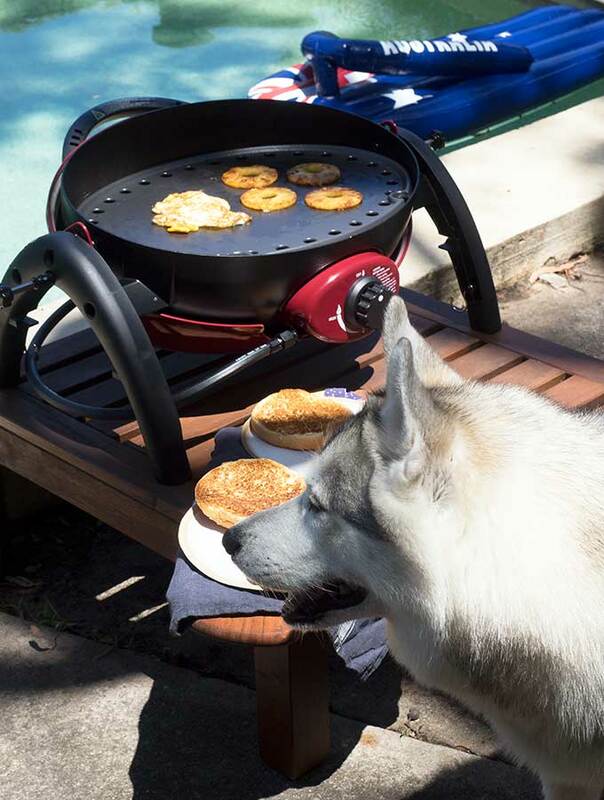 As great as burgers are, they taste even better when cooked in the great outdoors on a barbeque. They are easy to make, no fuss and delicious to eat. The most effort you will have is keeping a kooka (kookaburra) from swiping a patty as they cook. Craving chicken instead? My teriyaki chicken burgers may be the solution. Confession time, we own three BBQs, a smoker and a spit. Yes, we love eating outdoors anytime we get the chance. One of those is a portable, take anywhere, barbeque from Barbeques Galore. My little red Ziegler & Brown even comes with a carry case for easy transport. 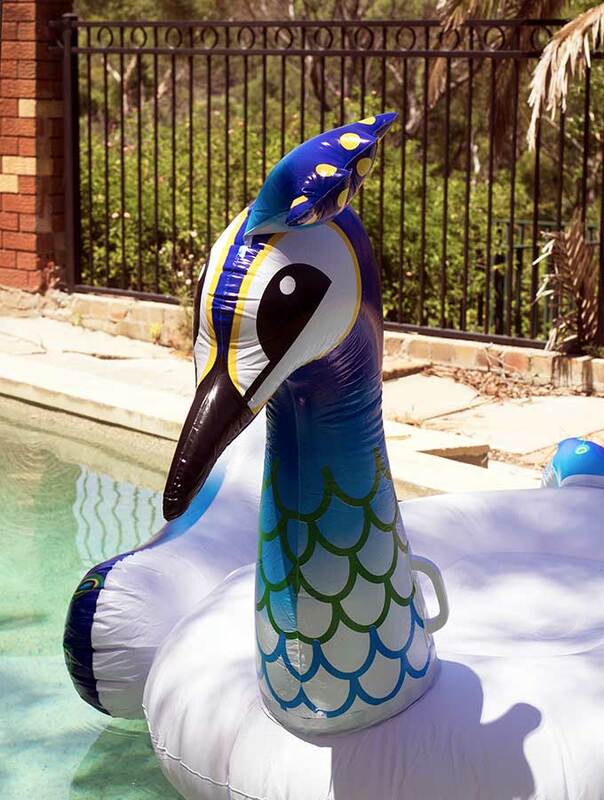 With the heat this summer it has made its way to our pool area and is getting a pool side workout. Harley has been super excited by this development. 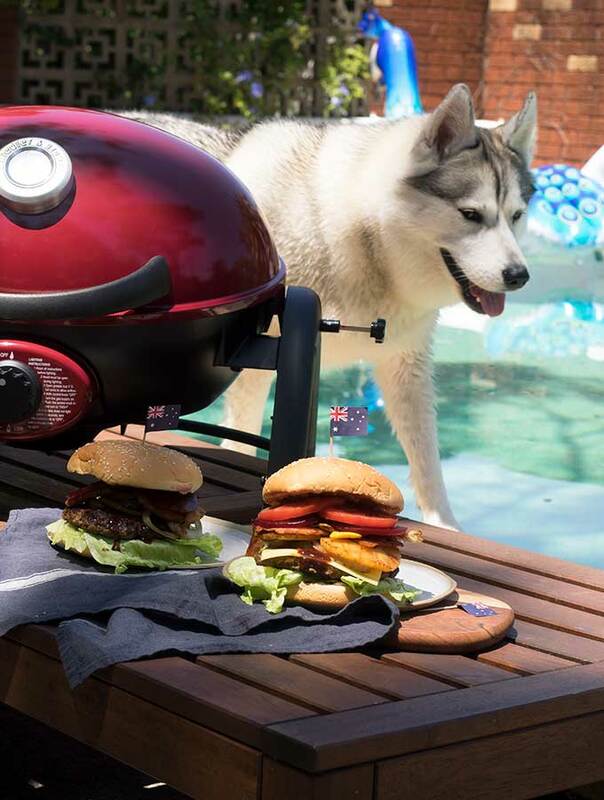 Two of her favourite things in the one place, swims and barbeque. What goes on a basic Aussie Burger? There are a few must have and key ingredients. Beef burger patty, lettuce, tomato, onion, slices of tin beetroot and sauce. The above ingredients are standard, but there are much loved additional items that we add. Cheese is very popular, as is bacon. A slice or two of canned pineapple is a personal favourite, but just like pizza, some believe it should never be put on a burger. If you are having a burger with the lot, it comes with all of the above plus an egg. What about the bun? A soft bun, classic burger bun. No sourdough, milk or potato buns. A simple old fashioned burger bun with sesame seeds. Toasted or not? Ahh the debate goes on, it’s a bit like pineapple, two firm camps. What doesn’t belong on an Aussie Burger? Pickles! Put the pickle jar down folks, there is no place for them here. Do note that Australian sliced tinned beetroot is pickled. Fancy cheese, no blue cheese or brie. No American cheese either! A simple slice of tasty, Cheddar or Colby. How do I like my Aussie Burgers? I’m not a “with the lot” kind of gal. I like my burgers manageable and able to get my mouth around them (just). The burger bun must be toasted and not buttered. I hate soggy bread of any kind, especially burgers. The beef patty shouldn’t be too thick. No more than 1.5cm (½ an inch). Well done with a nice crust. Complete contrast to how I have my steak, medium rare. Along with the patty you will find lettuce, tomato, onion, beetroot, pineapple and bacon. Onions need to be cooked, but not too caramelised, I still like a little crunch to them. 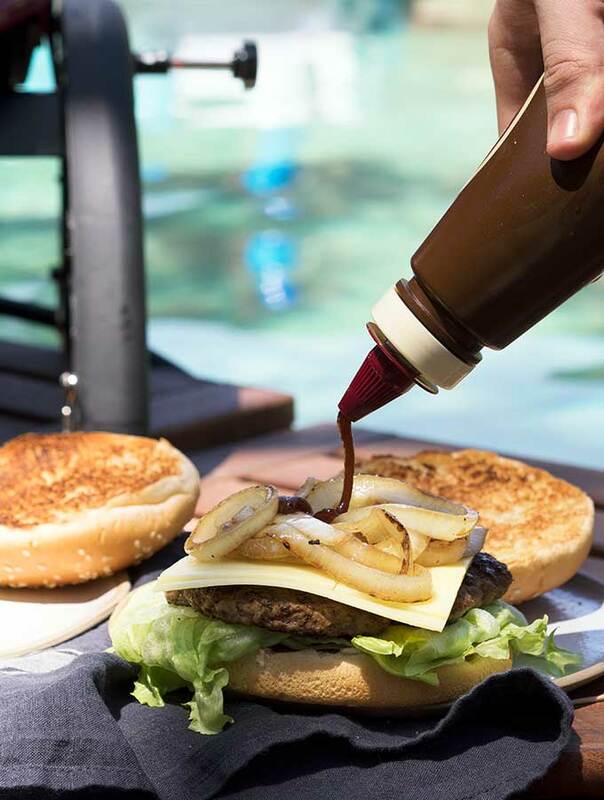 The sauce is barbecue, not tomato. Beef patties shrink in size when cooked. Make your patties larger than the buns they are destined for. I tend to make them a couple of centimetres (½ inch) wider in diameter. Aim for 180 – 200 grams of beef mince per patty. Don’t use lean mince, you need to have some fat to ensure it doesn’t dry out and stays juicy. Don’t bother with wagyu either, such a waste on burgers. When making patties, make the middles thinner than the edges. This helps keep your patties an even thickness once cooked. Patties shrink, and the centres bulge up a little. By making the middle of the patty thinner when shaping you will have a more even finished product. Don’t skip seasoning your beef mince (ground beef) with salt and pepper. Work the seasoning in with your hands. If you don’t like the feel of raw mince/ground meat on your hands, disposable gloves work a treat. To help curb any burger sogginess, drain the beetroot and pineapple well. Both the beetroot and pineapple slices should be thin. Construction and taste wise having thin slices of beetroot/pineapple spread out over your burger is better than one thick slice in the middle. Barbeque is my preference, but you can just as easily cook your patties in the kitchen. They really can be made anywhere. 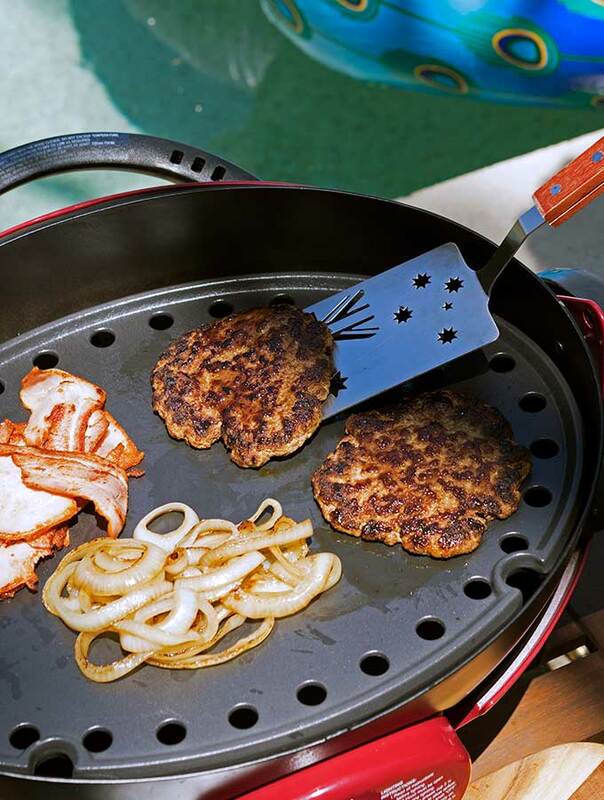 With my portable Ziegler & Brown barbeque from Barbeques Galore, picnic burgers in the park are so much fun! If you can’t find canned/tin beetroot don’t substitute with beetroot slices you have cooked yourself. No grated raw beetroot either. It just won’t taste the same. There won’t be, make the number of burgers you need. If you have more beef mince than needed for your burgers, make up extra patties and freeze them. Place some baking paper between each patty and wrap well in plastic wrap. They are easy to defrost and cook when needed. Behind the scenes with Harley! 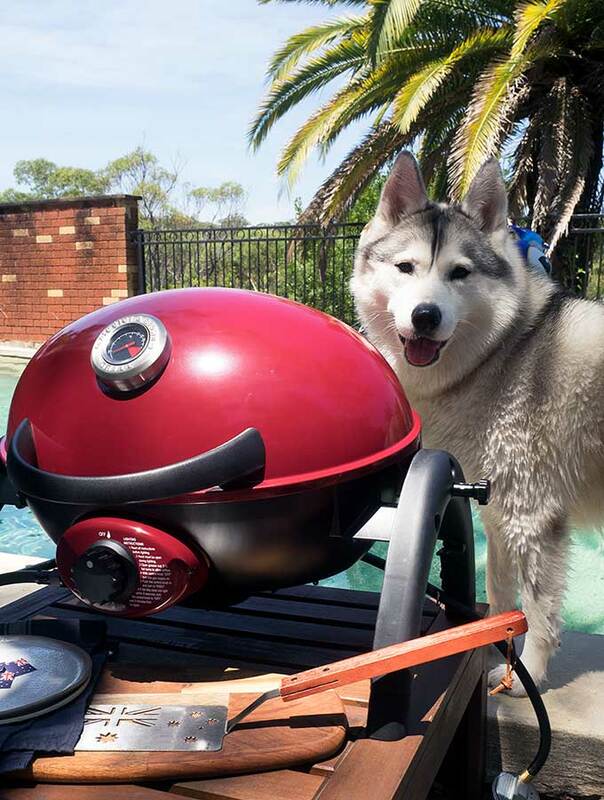 As mentioned Harley loves swims and BBQs. We were shooting this recipe on a 40°C (104°F) day. As we melted styling and photographing, Harley decided to have numerous swims. Between each dip she took it upon herself to supervise. She had a good day, burgers and swims. It’s a doggo’s life! There are no secrets what we will be doing this Australia day. 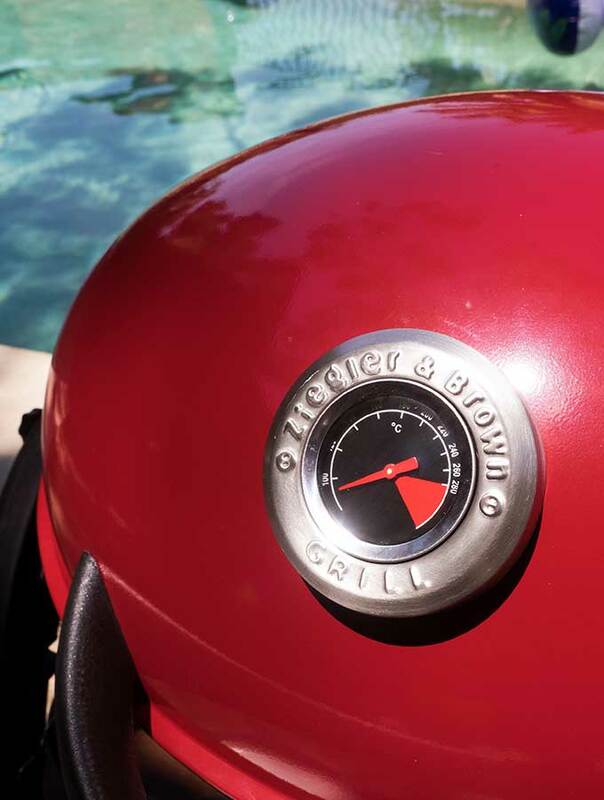 It will be a day filled with barbequing and swims. Belly Rumbles created this post in conjunction with Barbeques Galore, but all opinions remain her own. 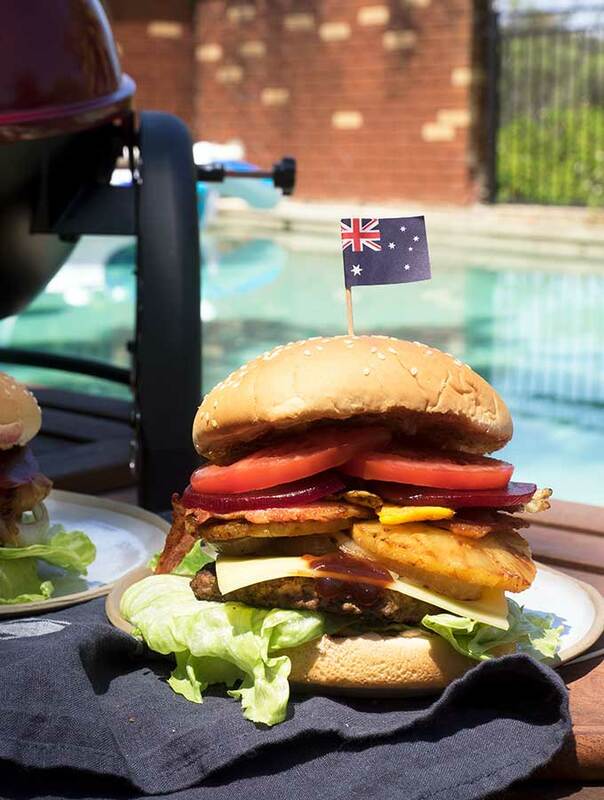 The Aussie Burger is a national icon, close to many Australians’ hearts and stomachs. Beetroot is a must, but the question is, a true Aussie burger with the lot or not? Either way you will love them. 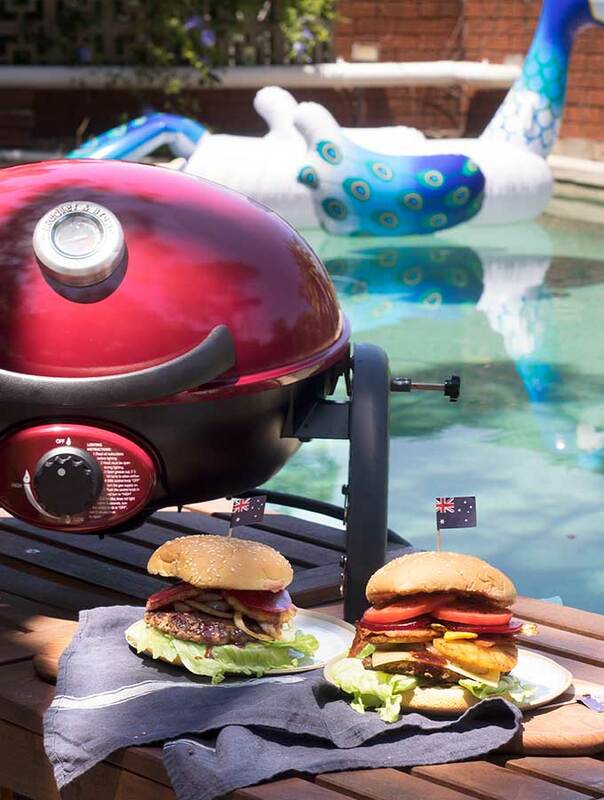 Plus you can’t be anymore Australian than an Aussie burger on the barbie . Place beef mince in a bowl and season with salt and pepper. Using your hands work the seasoning through the mince. Shape mince into 4 beef patties. Turn barbeque on to a medium heat. 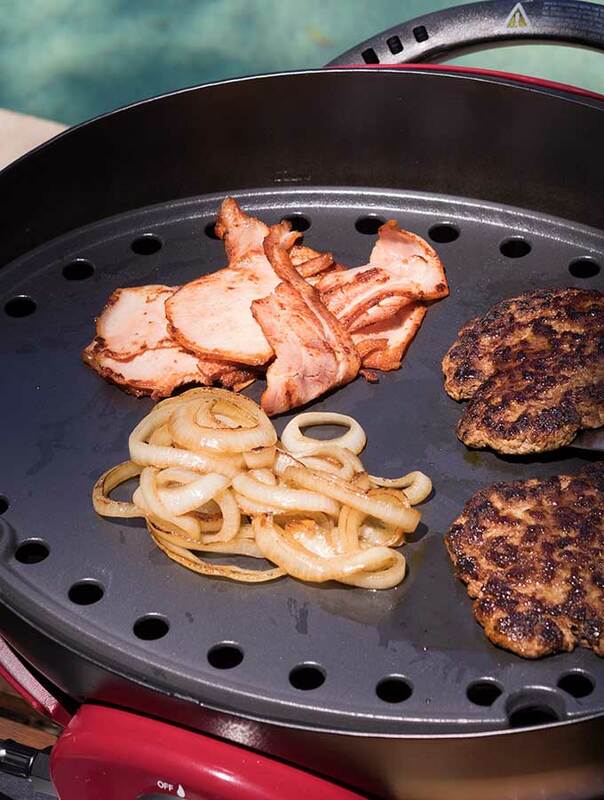 Place beef patties and sliced onion on the barbeque to cook. Cook beef patties until they are cooked and have formed a nice caramelised crust on one side. Then flip the patties and continue cooking. With tongs, toss onions on the hot plate every so often to cooke evenly until they start to caramelise. Once done take off the barbeque and wrap in aluminium foil until needed. If you are adding bacon to your burger place the bacon on the barbeque at the same time as the beef patties. Cook bacon to your liking. Place pineapple rings on the barbeque to heat through at the same time. If adding egg to your burger this is the last item to be placed on the barbeque for cooking. Cook to your liking, solid or with a runny yolk. 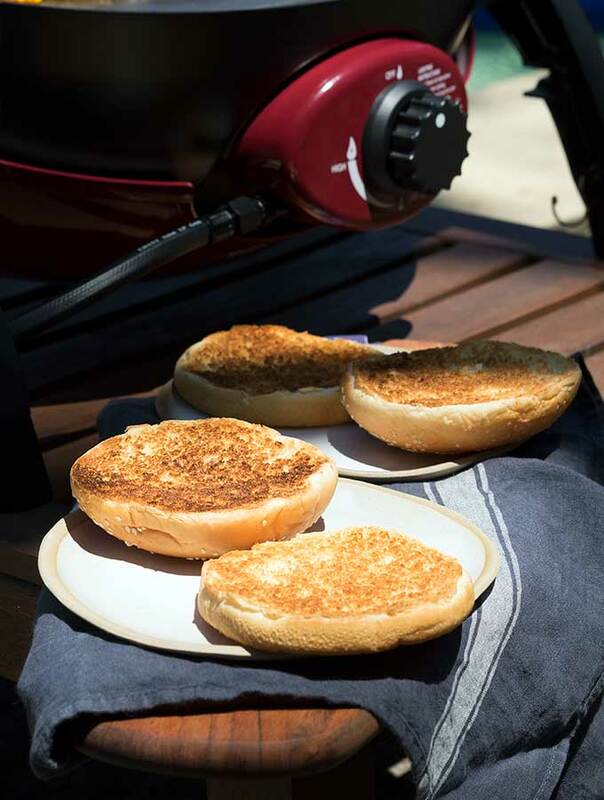 Place split hamburger buns on the grill of your barbeque to toast. Place lettuce on the bun first, followed by the beef patty and onions. Add sauce of choice, barbeque or tomato, on top of the onions. Then add the rest of the ingredients you have chosen. If adding cheese place this between the burger patty and onion. Aim for 180 – 200 grams of beef mince per patty. Don’t use lean mince, you need to have some fat to ensure it doesn’t dry out and stays juicy. Perfectly described and even though I’ve just had lunch I want a burger now! Maybe I better add all the ingredients to my shopping list for Australia day too. I bet that chef has never even tried a proper well made authentic Aussie burger. tut tut. Got to have canned beetroot slices on my burger ! Have a great Australia day. I’m sure our dog won’t be jumping in the pool with us though as she hates water lol.